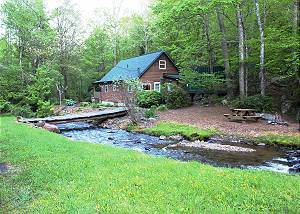 Located on a stocked trout stream, minutes to Todd, NC and RiverGirl Fishing Co this cabin it all. From the rushing creek, a bubbling hot tub, WIFI, & air hockey table Roaring Creek has something for everyone. Just a short drive to Boone & West Jefferson. Enjoy a beautiful sunrise over the Blue Ridge Mountains in the bubbling hot tub at this like new log cabin. Conveniently located to the New River, the Jeffersons and Virginia State Parks, Stone Fireplace, and spacious deck for relaxing. River lovers this cabin is for you! 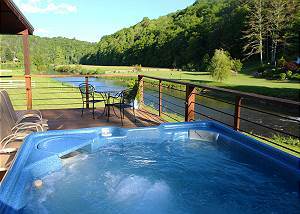 Enjoy views of the New River from the bubbling hot tub. Easy access to the New River allows for fishing, canoeing, kayaking or rafting, just bring your own equipment. Convenient to West Jefferson & Boone. 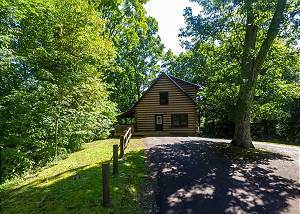 Located just a short drive from downtown West Jefferson and located just 1/2 mile from the New River this cabin is nestled on 32 acres for total privacy with a bubbling hot tub, air hockey and WIFI! Located in Todd, just minutes from Boone, Blowing Rock & West Jefferson, this authentic log cabin offers a beautiful rustic exterior, screened in porch with hot tub, outdoor fire pit, and babbling creek. fiber optic WiFi, King bed, and pets welcomed. 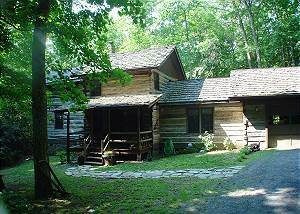 Enjoy the sounds of the New River and take in the Blue Ridge Mountain atmosphere created by this cabin's location. Happiness is….a fun-filled riverfront vacation! Look no further this is the perfect family vacation home. Located on the banks of the New River close to Jefferson this three bedroom, two bath home sleeps up to 10. 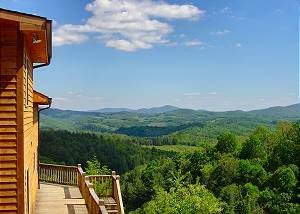 Nestled amid the trees, Paradise Retreat offers long range mountains view from the deck yet privacy for those looking to escape to the magnificent Carolina Mountains. 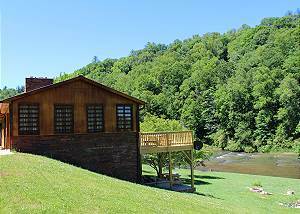 Overlooking the New River and just minutes to West Jefferson or Boone, this cabin is large enough for the whole family. Zaloo's Canoes is just a short drive away or walk down to the river & fish! Take in the panoramic mountain views that seem to go on forever at this spacious cabin. 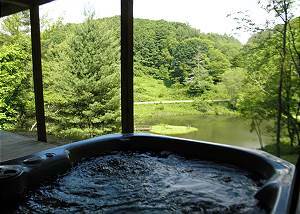 Minutes to the famous River House Restaurant, Shatley Springs Restaurant, Grayson Highlands National Park, and a easy trip to Boone & Blowing Rock.